Twitter is to roll out its List feature soon, which allows you to group your followers into certain categories. Announce this week in a blog, Nick Kallen (@nk) said about the new feature: "The idea is to allow people to curate lists of Twitter accounts. So, which list would you be in? TechRadar can see this turning into a Mean Girls style bloodbath, where you have a list of cliques, ranging from: 'annoying workmates' to 'stupidly smug celebrities' to 'I really don't know who you are but you keep sending me links to naughty pictures so I keep following you'. Kallen does point out the main benefit of lists, and that is organising the website – something that is welcomed. "We started working on this feature because of the frequent requests we received from people who were looking for a better way to organise information on Twitter," he explains. "Of course, that means not just Twitter.com – the Platform team will follow up in a few days with information on the Lists API. 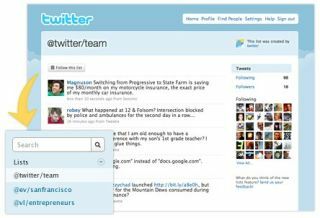 This will allow developers to add support for Lists into your favorite Twitter apps." There's no word on an actual launch date, but TechRadar will keep you posted.